You’ve probably already heard about the concept of User Experience (UX) and the matching virtue of User Experience Design. If not, you might want to go check it out. I would suggest you start with the excellent book “The Design of Everyday Things” from Donald Norman. It has nothing to do with software development, so you won’t mix up User Experience Design with Graphical User Interface Design or even Graphics Design. In short, User Experience is what an user of your software will experience while using your software. If your software makes them smile, you’re some kind of UX god. If your software makes them curse repeatedly, you’re probably not. You can try to improve the experiences of your users by making changes to the software. This is called User Experience Design and is an important part of software development. Most developers know nothing about User Experience Design. What developers naturally know about is Developer Experience (DX), a concept that isn’t really defined in the literature. I made it up to explain my point to you. Every software developer has a favorite programming language and IDE. Remember, the source codes of the same problem in different programming languages will ultimately yield the same machine code. The machine is totally agnostic about your preferences for a certain programming language. Your choice of a programming language for a certain problem is more about your Developer Experience than anything else. Developer Experience is everything you feel and think during software development. A bad Developer Experience lets you swear about the tools, the code and everything and everybody else around you. A good Developer Experience gives you a sense of accomplishment and safety while coding and makes your work not harder than necessary. They could add it to the code but leave the configuration files unchanged. This required the code to handle the “absent from configuration” case in a useful manner. It required the developer to make effort in the code. The user would not know about the new configuration entry if not stated in some external documentation. They could add it to the code and write a configuration migration script that added it to the existing configuration files on the customer’s installation. The code could now expect the entry to be present, but the developer had to write and test the migration script code. The user would see the new configuration entry with the default value. They could introduce a new configuration file to the system and place the new configuration entry in it. The code could expect the entry to be present, because new configuration files were added to an existing installation during the upgrade process. The user would see the new configuration file and the new configuration entry with the default value. You can probably guess which of the three options got used so excessively that users complained about the configuration being all over the place, in a myriad of little one-liner configuration files with ominous names. The developers chose the best option for them and, in short view, for the users. But on the long run, the User Experience declined. The second example is from a computer game in the mid 2000s. It was a massive multiplayer online shooter with a decent implementation ahead of its time. But one thing was still from the last century: After each update of the game, the key bindings were reset to the default. And every other aspect of local modification to the settings, too. After each update, you had to configure your video, audio, controls and everything else like your in-game equipment again and again. The game didn’t offer any means to copy or reload your settings. It was up to you to maintain a recent backup of the settings files just in case. And if the file format was changed, you needed to combine their changes with yours. WinMerge is a decent tool for that task. But the problem is clear: The game developers couldn’t be bothered to think about how their upgrade strategy would affect their users. They ignored the problem and let the users figure it out. They chose better Developer Experience, free from complexities like user-side modifications over good User Experience like a game that can be upgraded without drawbacks for the gamers. 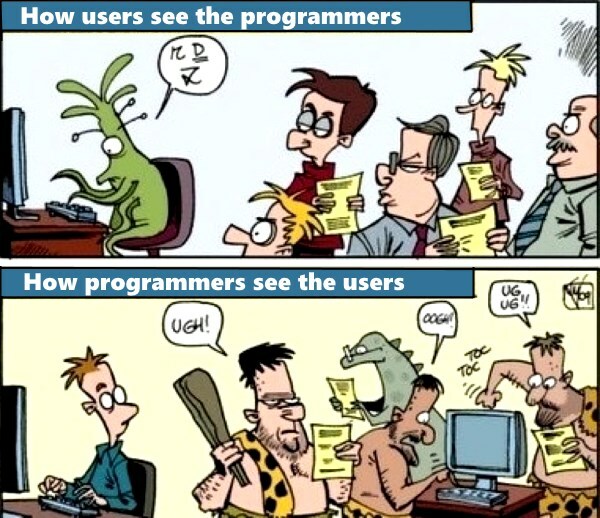 Sadly, this is an usual formula in software development: Developer Experience is more important than User Experience. Just look at it from an utilitarian point of view: If you burden thousands or even millions of users with just an easy one-minute task that you could fix during development, you have a budget of two workdays up to 10 person-years. Do the math yourself: One million users, each spending one minute of work on your software, equal to over 2000 workdays lost on a thing you could probably fix for everybody in an hour or two. And this brings me to my central statement: Developer Experience, as opposed to User Experience, means nothing. It’s just not important. At least for all the users. It is important to the small group of developers and should not be forgotten. But never should a decision lead to better Developer Experience on the expense of User Experience. It’s a small inconvenience for us developers to think about smooth upgrades, meaningful and consistent control element titles or an easy installation. It’s a whole new game for our users. Always choose User Experience over Developer Experience. Call to action: If you have another good example of developers being lazy on the expense of their users, please share it as a comment. Call to action 2: The initial picture is linked from the excellent website badhtml.com. If you ever feel like an imposter for your latest design, go and visit this website.